You only need a few seconds, if you want to get fax number and receive faxes with WiseFax fax number. You can get a fax number quickly and easily by following the steps described below. How to get fax number and start receiving faxes with WiseFax fax online service? How do I receive faxes with WiseFax fax number? You’ll get an e-mail message every time when a new fax is received. Depending on your secure fax preference, you can find your received faxes either at WiseFax Account website, or also in your mailbox, saved as attachments. You can set your secure fax preference at WiseFax Account website, under “Secure Fax” section. If you opt-in for receiving copies of your faxes to your e-mail inbox, then every received fax will be sent to you also as an e-mail attachment. Otherwise you will get a message with link to WiseFax Account secure page, where you will be able to download the received fax. You can change your preference at any time. It is that easy to receive faxes with WiseFax fax online service. You can get your own US or Canada based fax number for the fixed monthly cost of $8.00 USD. 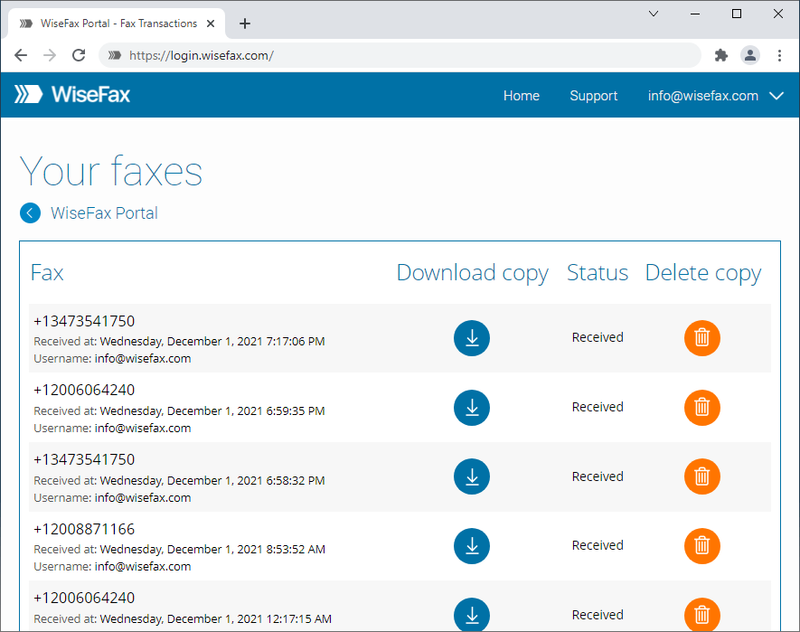 Subscription to fax online service includes one fax number, to which you can receive up to 300 pages per month, and additional 10 fax tokens that you can use each month for sending faxes. There are no start-up or cancellation fees. You can get your fax number immediately after registering or signing-in at WiseFax Account website, by choosing the option “Get fax number” and making a payment. Your new fax number will be activated immediately after completed order, and you will be immediately ready to receive faxes with WiseFax. If you already have an active subscription for your fax number, then you’ll find option “Your fax number” at WiseFax Account website, where you can monitor your subscription status. Subscription will automatically renew at the end of each subscription period, which also preserves your current fax number. You can cancel your subscription at any time, if you don’t want to receive faxes with WiseFax anymore, without any cancellation fees. WiseFax fax online service enables you to get fax number where you can receive faxes!